This 2-cabin layout Hanse 385 features a number of factory upgrades including an extended galley layout, volvo sail drive, electric primary winches with all running rigging leading aft to the upgraded carbon fiber double helms for easy single-handing, a self-tacking headsail, and a spacious interior layout with upgraded American Cherry interior and striped marine floors. The Hanse 385 is a dream to sail and her spacious beam allows for a roomy interior with a gourmet galley and comfortable salon. The interior is light and airy with the upgraded portofino cream leather seating, large Lewmar ports, and custom lighting system. Great incentives and ability to take a trade. Call today for a showing! Every sailor spends the majority of their time aboard in the cockpit, making it an essential feature in the design process. Hanse has designed a cockpit that is versatile with a rigging system that makes single-handing from the helm a breeze, but also allows for tons of room entertaining guests and lounging. The twin helm layout allows for easy passage from the large fold-down swim platform all the way through to the companionway hatch. The Hanse 385 carries its beam all the way aft allowing for an extra wide cockpit that can comfortably seat six. Wide cockpit coamings lead aft to each helm, housing all of the running rigging. This allows you to handle the sails and lines without ever leaving the helm, including the self-tacking headsail. A large drop-leaf cockpit table provides the perfect setting for entertaining. 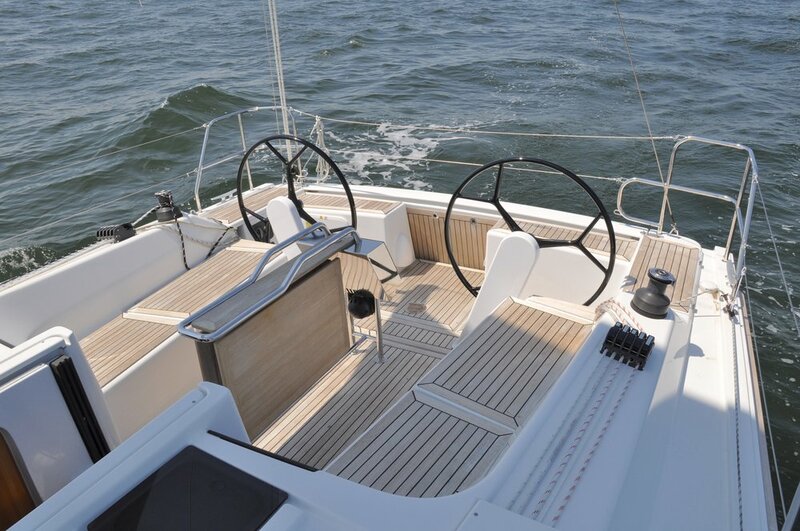 The table’s stainless steel handrails and foot rail provide a sturdy support during athletic sailing. The Hanse 385 offers a wide range of comforts that make cruising a relaxing and enjoyable experience. Hanse takes their design quality a step above with thick cabinetry doors, plush upholstery, and ample natural light through large opening Lewmar ports and hatches. The interior design offers an attractive and functional space with a large salon and gourmet galley for entertaining, storage throughout the yacht, spacious double-berth cabins forward and aft, and a large head with plenty of elbowroom for showering. The main salon captures Hanse’s clean and modern design aesthetic with crisp lines, large ports for tons of natural light, spacious seating and cherry cabinetry, providing a warm and inviting place to rest and entertain after a fun day of sailing. A large u-shaped settee to starboard can be converted into a double berth and a long settee to port offers additional seating. You can comfortably seat 5 people (squeeze 6) around the centerline drop-leaf cherry table for a meal down below. The plush Portofino cream leather cushions are great for lounging while you sit back and listen to the fusion stereo located at the chart table on the port side of the salon. The smart lighting system touch control pad at the starboard settee allows for quick lighting options for the four overhead LED lights and two accent lights running forward along the cabin top. A large bar locker below the table and an added wine cellar rack below the salon floorboard offer additional storage. 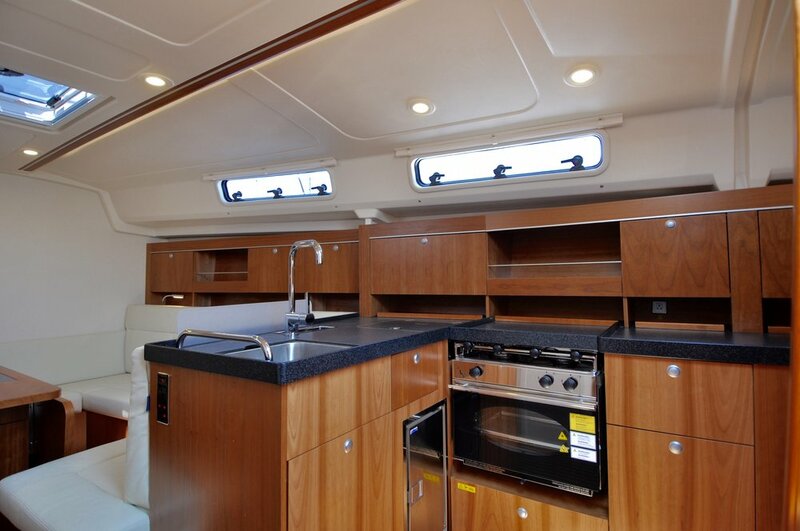 This stock Hanse features the optional extended galley layout that provides a ton of space for preparing a gourmet meal. With the extended galley, it has a ton of added counter space and an additional Isotherm refrigerator drawer that supplements the top and side loading main refrigeration compartment. So many yachts are designed without enough counter space to have things resting on the counter while you cook and access the fridge. 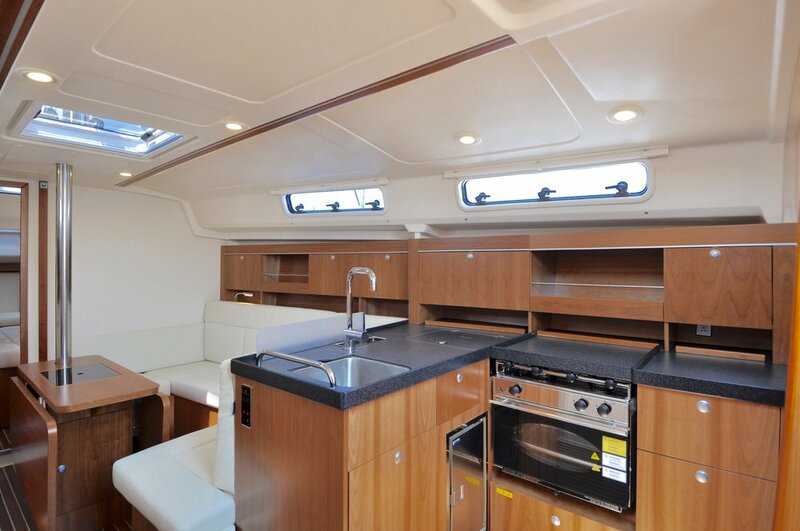 The Hanse 385 breaks that trend with over 9 feet of counter space! 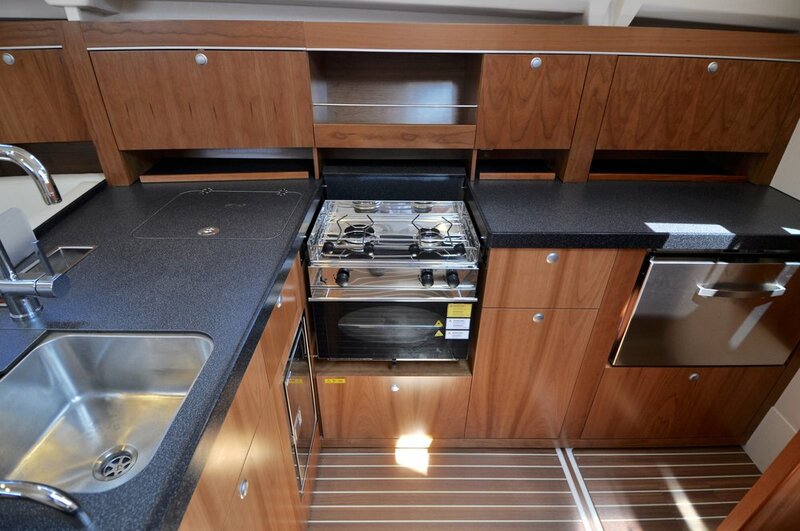 The galley also features a double-bowl stainless steel sink and gimbaled 2-burner propane stove and oven. There is also a ton of storage with 5 deep storage cabinets, 5 storage shelves, and a designated foldout trash compartment. 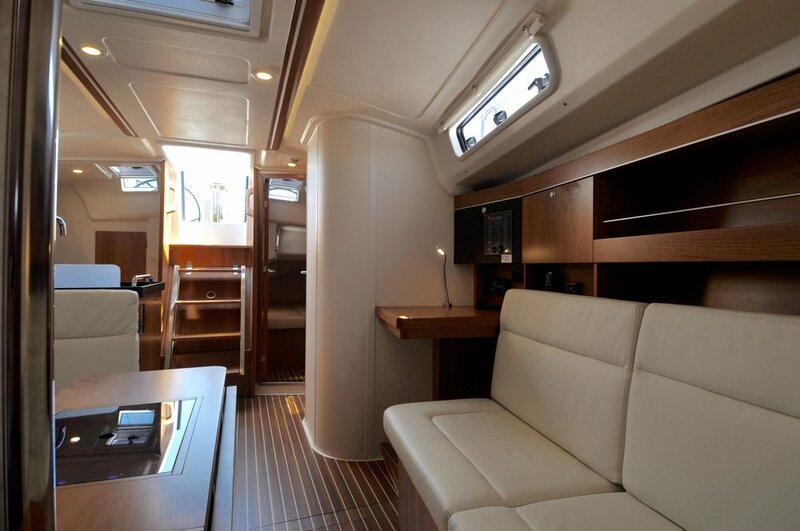 This Hanse 385 features the aft facing chart table option forward of the head in the main salon on the port side. The American cherry chart table offers 2 ft. of workspace and storage while navigating or for working at as your home office. A personal reading light and large opening side hatch offer light. The nav station is home to the 120v/12v electric panel which is conveniently located on an easy-access opening panel. The stereo unit, VHF radio and gas control panels are also at the nav station. The Fusion stereo offers a connecting dock for your ipod/iphone/android device. 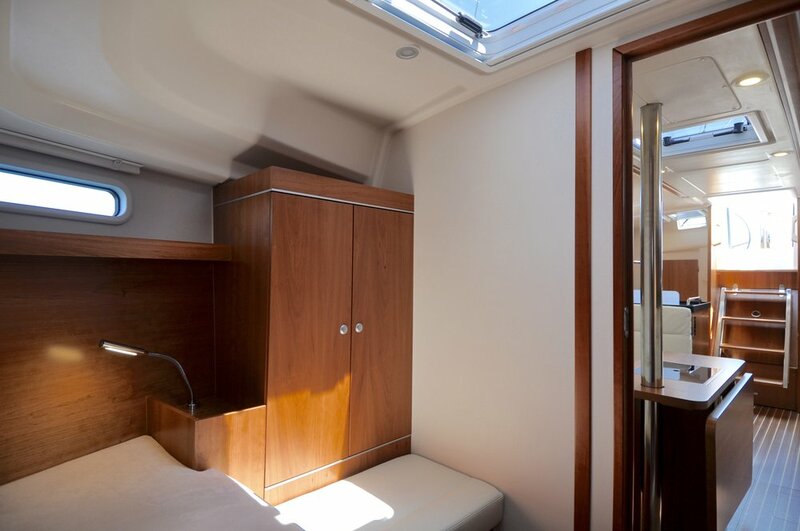 The forward cabin of the Hanse 385 features a large V-berth over 7ft long and 7ft wide, offering a large comfortable berth to lay back and relax. The two overhead Lewmar opening hatches allow a wonderful breeze to come through the cabin while on the hook. Personal seating is in front of a large hanging locker to starboard and another deep locker to port offers additional storage. The two overhead hatches and two fixed side ports make the forward cabin a bright and airy space. The berth is low enough for easy in-and-out access. This model of the Hanse 385 features the single aft layout with a comfortable aft of the head and chart table on the port side. 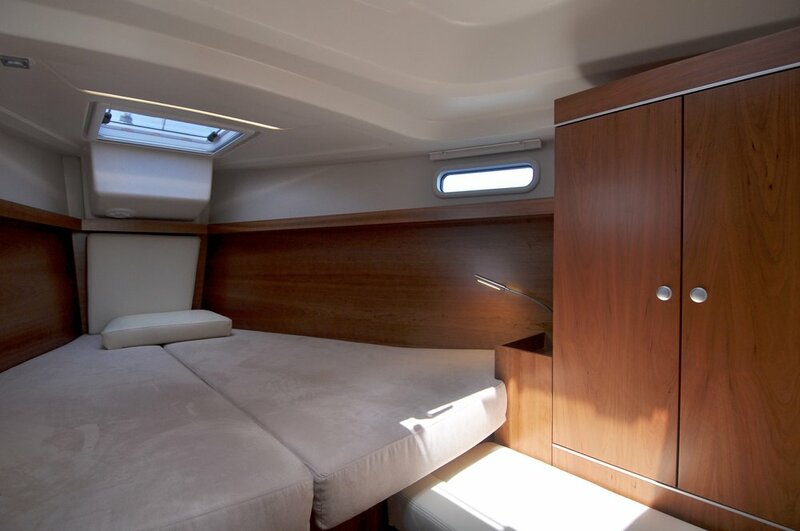 The aft cabin offers a spacious double berth with plenty of privacy from the forward cabin. The double berth is 6’10’’ long and has comfortable 4’’ cushions. There is plenty of storage with a deep hanging locker to port and a long storage shelf leading aft. Two opening Lewmar hatches, a fixed side port and an additional skylight from the cockpit provide tons of natural light and ventilation. 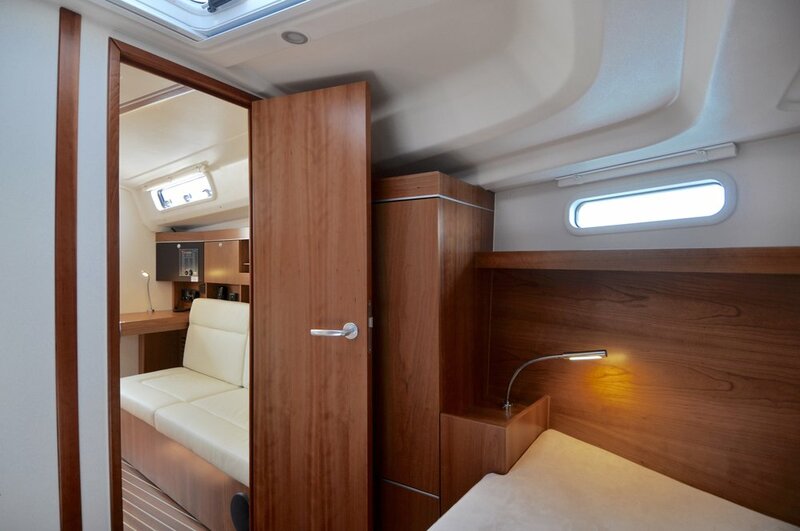 The Hanse 385 features a spacious head that offers plenty of room for showering and day-to-day use with storage and tons of ventilation and natural light. The American cherry vanity with a vessel sink is modern and practical with storage above and below the sink. Backlit shelves offer additional storage and the large opening side port stretches almost the entire length of the head providing natural light and ventilation. This Hanse 385 features the standard 28hp Volvo D2-30 diesel sail drive with a folding prop. The sail drive allows for very easy handling when motoring. It is also much quieter than your average direct drive configuration. Because the shaft makes a 90-degree turn, the engine vibrations often heard with a direct drive engine are quieted exponentially. The engine panel, hour meter and throttle are located at the starboard helm. 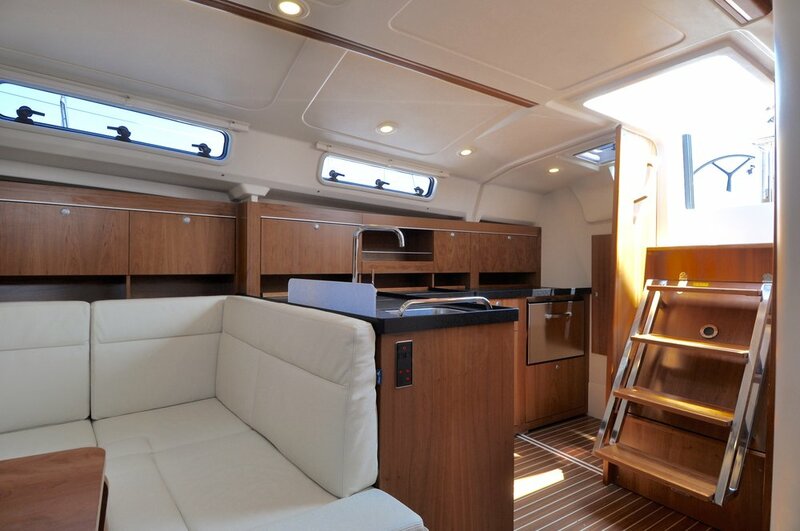 This Hanse 385 features the upgraded battery package and a battery charger. With 155 amp hours, you don’t have to worry about powering up the electric primary winches or the fusion stereo eating up your amp hours. The electric panel is located at the chart table and can be easily serviced thanks to the quickly removable face panel. The 12v and USB outlets at the chart table are readily available for quick charging as well as 120V outlets throughout the yacht. The Hanse 385 is designed for easy sailing and single-handing. Hanse’s innovative design features a self-tacking headsail and a rigging system that allows you to control all of the lines from the aft helms. The running rigging is actually recessed in the cockpit coamings leading aft to the upgraded electric primary winches. This makes for a clean look and practical sailing. The standard flaking main features a german mainsheeting system that has a single line control at both helms. The upgraded sails package includes an Elvstrom FCL (fast cruising laminate) fully battened main sail and self-tacking jib. The FCL material features carbon fiber strands sewn into the sail to provide extra strength and longevity while also being protected within the sail canvas from UV rays. The main has two reef points with a single line reefing system that can be controlled from the cockpit. The hanse rigging system allows you to simply put the sails up with the electric winches, set the sails, and then sit back and relax. The HANSE 385 is well designed, great sailing boat. She is stable, beamy and has a wonderful layout. This 385 is equipped with the two cabin, extended galley layout. Port settee with fixed nav station. Well thought out floor plan and smartly equipped...We think you will be suitably impressed too! Schedule your visit today - great incentives on this IN STOCK Hanse 385! Needs Color Selection for Canvas and Final Canvas Details. Call your CYS Broker today for more details or to schedule a showing.